He wasn’t prepared when he began his career, and now he’s the veteran watching others do the same thing. Eli Manning has had many memorable moments in his career with the Giants. One that will always stick with him took place in Baltimore about 13 years ago on Dec. 12, 2004, when he made his fourth career start. Manning had the worst game of his career. He was a bumbling rookie quarterback overwhelmed, overmatched and openly mocked on the field by the Ravens’ defense. He completed 4 of 18 passes for 27 yards, threw two interceptions and was sacked twice. Passer rating: 0.0. As they came off the field that day, many of his fellow Giants must have been shaking their heads in disgust. 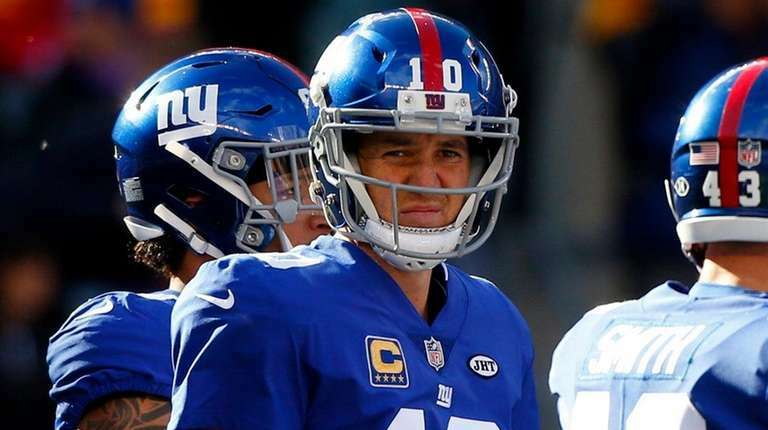 They were a veteran team just a few years removed from a Super Bowl run, and they were poised to contend for a playoff spot that season until Tom Coughlin, in his first year as head coach, yanked Kurt Warner and inserted Manning into the lineup. How must those players, many toward the end of their careers, have felt having to endure someone else’s growing pains at their own expense? Manning has improved since then. He went on to win a pair of Super Bowls for the Giants, was named the game’s MVP each time, and is the franchise leader in just about every passing category there is (good and bad). Not everyone on that 2004 team still was around to enjoy it when Manning succeeded, but despite any veteran grumbling that took place on that train ride back from Baltimore, in retrospect, it was the right call for Coughlin and the Giants to make. Manning’s career has come full circle from that miserable experience. Now he’s the veteran wondering how much longer he’ll be playing in the NFL, seeing his window for championships closing with each passing day and each passing loss. Now Manning is the established player surrounded by a group of teammates who are, for the most part, exactly what he was when he took the field in Baltimore 13 years ago. Bumbling rookies. Unpolished journeymen. Unproven players. When he entered the huddle to start Thursday night’s game in Washington he was surrounded by 10 teammates. Only two of them were projected starters at their positions when the Giants broke training camp. Seven of them had less than three full years of NFL experience. Manning, circa 2017, is playing with a team full of Mannings, circa 2004. He is coming off a game in which he threw for 113 yards, his lowest total since he had 111 in Week 15 of the 2007 season. That game, though, was in stormy Buffalo, and the Giants won it, thanks to Ahmad Bradshaw’s breakout performance. There are only two games in which Manning has thrown for fewer yards than he did on Thursday night in Washington and lost: A 74-yard performance against the Saints in Week 16 in 2006 and that Ravens game in 2004. So instead of winning games, hitting Odell Beckham Jr. on deep routes and finding Brandon Marshall on fades in the end zone, Manning is playing tour guide to a group of beginners. None of this is meant to exonerate Manning for Thursday’s loss, or the dismal season. He missed a couple of passes that could have made a difference, including one to Shane Vereen on a key third down in the red zone in the first half. And he’s had his share of miscues in close games before this, including a fumble deep in Giants territory against the Chargers and another when the Giants were on the verge of scoring against the 49ers. The Giants lost both of those. Nor is he the only one paying the price for the Giants’ unplanned youth movement. Ben McAdoo, too, has had to adjust his coaching philosophies from Super Bowl expectations to remedial development. McAdoo said the young players “took a step backward” in the Washington game. Manning, more than anyone, knows that. He went through it. He was thrust into the flames of a team used to winning and became one of the main reasons it was not. Now, though, he’s on the other end of that equation. He’s the one looking at his career wristwatch and wondering if he’ll still be around when these teammates are in a position to flourish. He’s the one enduring their football immaturity, which ultimately may be for the good of the organization but right now feels as if it’s to the detriment of everything else. That’s something a quarterback should say in OTAs or training camp, not in late November. And that’s a rough way for a potential Hall of Fame career to head into its final stages, even if it is very similar to the way it began.